Mods: I did the shoulder seams in a three-needle bind off, and I only used three buttons instead of the recommend four because they are so big. 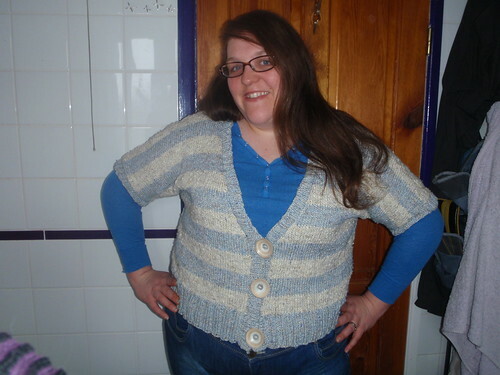 Inspired by all the stripey garments in the last Knitscene, I came home from Saturday knitting group in the middle of March and hauled out this yarn I bought in a sale a few years ago for a stripey garment, and quickly found this pattern to go with it. It was quite a quick knit, all things told. It took me 6 weeks according to Ravelry but the fronts took me about three days in total so that should give you some idea of how quick it can be when you set your mind to it. 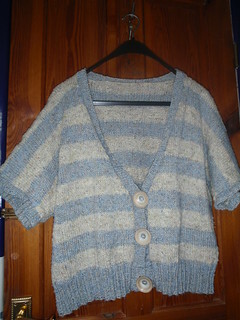 It's got a lovely drape and it's pretty warm; I love the way the stripes turned out and then finding natural material stripey buttons in Get Knitted was the perfect end to the story. Now...could the rain please stop so I can actually wear it, please?